Cone failure causes significant risk to personnel safety and structural integrity. 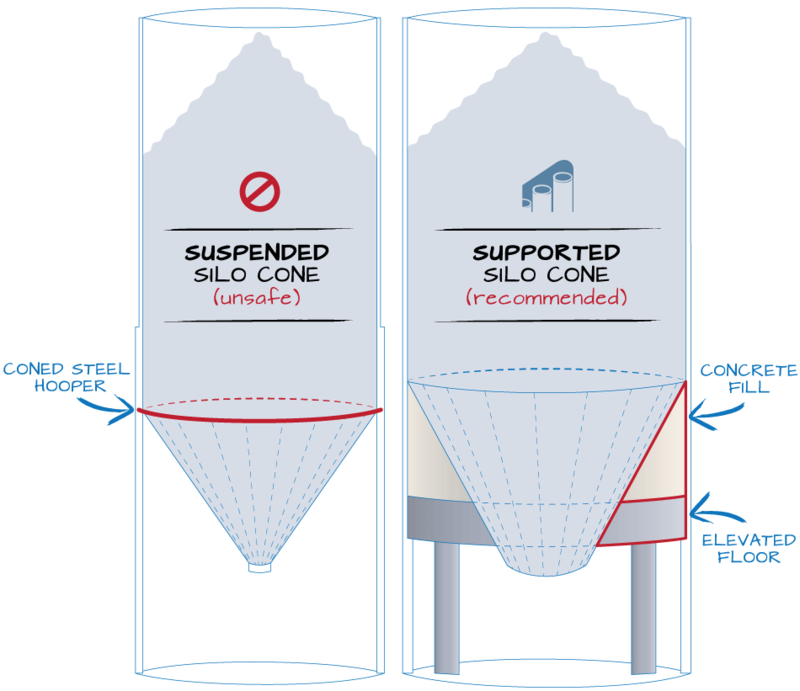 In many bulk storage ash silos the cone hopper is often chosen for material flow-ability purposes. 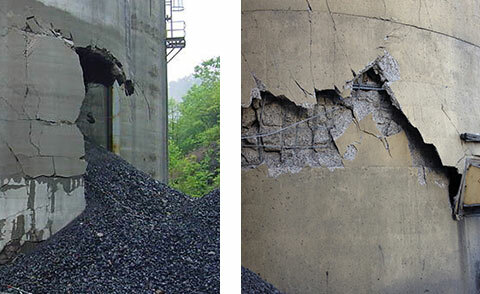 Despite the fact that structural failures attributed to suspended steel cones supported directly on the silo walls have been documented for decades, specifiers seeking lower costs continue to use suspended cone design as a cost reduction tool. As early as 1992, a majority of engineers serving on the Silo Design Committee of the American Concrete Institute (ACI 313) concluded that lower cost suspended steel cone designs were not worth the risk based on known failures. Suspended cone hoppers use a structural steel ring girder or a reinforced concrete ring girder sitting on the silo wall ledge or on silo wall pilasters or columns. Other designs anchor the suspended cone hopper directly to the silo wall, requiring the silo wall to be designed and built with a heavily reinforced wall section that acts as a ring girder. Marietta Silos has designed and built silos in the past using suspended cone hoppers that are ring girder or silo wall supported. But based upon our field observations and inspections of many such silos over the years it is our opinion that a bottom supported concrete floor system is preferable. We have designed and built many successful silos with bottom supported hoppers. The bottom supported concrete floor design is a more robust structural system, offering less risk to the owner than the suspended cone type design. The hopper and ring girder structures for a suspended cone silo are very heavily loaded. Essentially all of the stored material weight must be supported by the hopper cone by its attachment to the ring girder, and by the ring girder itself. The suspended hopper cone is constructed using rolled or broken pieces of steel plate. The steel plate pieces are assembled in the field and welded together. The welds between the hopper plate pieces must be full penetration welds meeting the requirements of the American Welding Society. It is essential that the hopper plate pieces fit up to the very exacting standards required by AWS for the full penetration welding. Most silo contractors hang the hopper pieces from the silo wall one by one, and force-fit the pieces together. It is very difficult to achieve the proper weld fit-up. Tolerances in the silo wall constructed diameter and thickness contribute even more difficulty to the plate fit-up. Finally, all of the full penetration welds in the hopper plate must be tested to insure the welds have been performed properly. Due to the likelihood that the weld fit-up will not meet AWS requirements, the weld testing should be even more extensive and critical than typical. The hopper support mechanism, must be an independent ring girder or a stiffened section of the silo wall. It must also be designed to carry the entire weight of the silo contents in the case of these structures. If the proposed design includes silo wall anchorage, with an integral ring girder, the design and construction of the section are very demanding. The section of wall at the hopper attachment must be designed to accommodate ring compression, vertical bending and vertical shear strength required to support the hopper forces and tension anchorage for the hopper. The result is a very heavily reinforced section of silo wall. The placement of the reinforcing steel and anchorage in a small height of silo wall is challenging. It is especially challenging if the silo wall will be built using slip-form techniques. The contractor must install a large amount of reinforcing steel and hopper anchorage steel in a small area of silo wall within a short amount of time. Rather than using a suspended cone hopper, our design supports the hopper from below, utilizing a thick reinforced concrete slab. The slab is supported by a ledge in the silo wall. A small portion of the steel hopper cone extends below the concrete slab. Above the concrete floor, the sloped conical hopper will be formed using thin steel plate backed by concrete fill. The steel hopper plate is merely a wear liner, not a structural element. The hopper plate welding consists of small fillet and groove welds. The welds serve only to anchor the plates in place during construction, and are not structural welds. Supporting the hopper from below using the thick concrete bin floor offers several advantages to the owner. The construction of the concrete floor provides a more robust structural support than the suspended hopper. The more robust construction is better suited to tolerate variations in ash material properties and the flow pattern within the hopper. The construction of the concrete floor is less demanding than the construction of a suspended plate hopper and wall supported ring girder section. Tolerances for the concrete floor allow for much greater flexibility in the construction, and do not require the precision required of full penetration welds or a silo wall anchored hopper. Supported steel cone design is safer than suspended cone design based on documented failures of suspended cones. No notable occurrences of failure. Hanging. Suspends load on singular reinforced silo wall anchors and welded connections at the top of the cone. Stacked. Fully supports the load from the ground up through reinforced concrete slab, more evenly distributing weight. Localized load points decrease overall strength of cone structure. Disperses load across broader area for increased strength. Requires extensive precision structural welding in the field, plus critical inspection to assure safety. No structural welds are required. Metal plating simply serves as a wear liner instead of structural support. Poor structural support focuses on reinforced silo walls or columns, concentrates large loads onto small areas. Completely integrated structural support apportions full load across the structure. Reacts poorly to variations in flow pattern. Effectively tolerates shifts in flow patterns. Requires time-consuming and costly full-penetration welding on-site and under variable conditions. Requires less extensive welding on wear liner only.